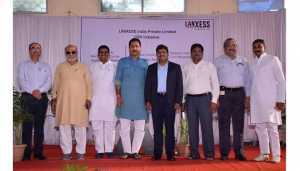 LANXESS India Private Limited, the leading specialty chemicals company has created a benchmark in the chemical industry by taking another major step towards developing a sustainable environment in & around Nagda. While undertaking three projects as part of the company’s Corporate Social Responsibility, LANXESS India has committed to build a Culture & Recreation Centre, a Digital Library and will be donating another Dialysis machine to the Nagda Civil Hospital. Through these projects, LANXESS India will be spending Rs.1.40 crores as part of its CSR outreach for the year 2018-2019 in Nagda. The CSR activities for 2018 were announced at an event organized a the Nagda Community Hall in the presence of Mr. Ashok Malviya, Chairperson Municipal Council, Mr. Dilip Singh Shekhawat, Member of Legislative Assembly, Khachrod-Nagda Constituency, Mr. Neelanjan Banerjee, Vice Chairman & Managing Director, LANXESS India, Mr. Sanjay Singh, Site Head – Nagda, LANXESS India and other esteemed dignitaries from the state and local administration.